Within a short distance from The Hayloft there are limitless opportunities for making your holiday in The Trossachs one to be remembered. Whether you're wanting to be active, enjoy fishing or golf, want to learn more of Scotland's history or enjoy touring to see spectacular scenery, come and stay with us soon. 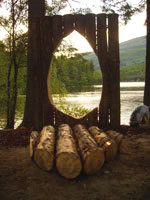 Within a 10 minute walk, you can be deep in the woods of The Queen Elizabeth Forest Park. 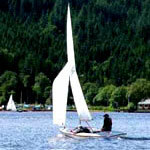 Discover tumbling rivers and crystal clear streams, and the traffic free south shore of quiet Loch Ard. Follow the roads deeper into the forest and you will be rewarded with tranquility, spectacular views and a rich variety of plant and animal life. Whether at the height of summer or the depth of winter, the scenery is breathtaking! For energetic hill walkers, Ben Lomond, Ben Venue and Ben Ledi are close by, with many other Munros(mountains over 3000 ft) and Corbetts (over 2500ft) within easy reach. Ben A'an is a good starter hill walk for youngsters who will be rewarded with spectacular views over Loch Katrine at the summit. There are miles of way marked cycle routes with choices to suit everyone:- safe family friendly sculpture trail, short or long distance, easy or strenuous, and cycle hire is readily available. 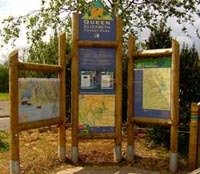 The Millennium National Cycle Route 7 passes through Aberfoyle on its way between Glasgow and Inverness. For The Hayloft we have Walkers and Cyclists Welcome certification from VisitScotland to meet your walking and cycling needs. in it or on it, wet or dry, active or passive - it's your choice! 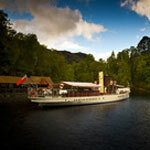 Canoeing in lochs and on rivers, fishing, bird watching quietly in a boat, dingy sailing on Loch Ard and Loch Venachar or sailing on the historic SS Sir Walter Scott or The Lady of The Lake on Loch Katrine. These are just a few of the opportunities for enjoying all that The Trossachs, land of sparkling lochs and quiet and rushing rivers. Go Ape High Wire Adventure Course is located at The David Marshall Lodge in Aberfoyle and is a great day out for all the family. Click on the image to get a 10% discount on yours tickets by using the form on the page to book your tickets in advance. 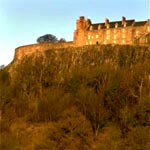 Whether you enjoy fishing on quiet lochs or trying your luck on on the Forth or the Teith you will not be disappointed. Fish for wild brown trout on woodland lochs, or rainbow trout on the well stocked Lake of Menteith (only Lake in Scotland!). 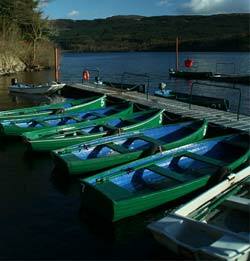 Salmon and Sea Trout are returning in greater numbers, and Pike fishing is very popular throughout The Trossachs too. 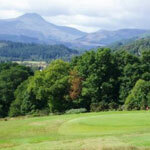 Golf courses may be found in many Trossachs communities. 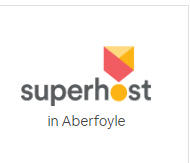 The 18 hole Aberfoyle course will test your golfing prowess but with stunning views to Ben Lomond, across Flanders Moss and as far away to Stirling and The Wallace Monument it's worth a game! Knights Templar, Rob Roy, Jacobites,Queen Victoria, Sir Walter Scott, General Wade, Thomas Cook .. famous folk who, realising the beauty and bounty of the Trossachs, have lived in or visited The Trossachs. Stirling and Doune Castle, the Wallace Monument, the Victorian architecture of the aqueduct taking water from Loch Katrine to Glasgow 26 miles away, are all worth exploring. 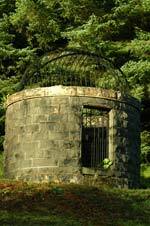 And there's much, much more to find out about the Trossachs past. Go quietly, go slowly, look about you! Loch Lomond and The Trossachs National Park aims to preserve the wild habits to encourage and protect the wildlife living in this spectacular area. Red deer, red squirrel, Golden eagles, Ospreys, buzzards thrive here but these are not the only animals to be found. Wild flowers and other plants of special interest find their own niches, from the bogs of Flanders Moss, in the woodlands and to the tops of the mountains of The Trossachs.